A student holds up her sign during the March for Life. The event attracted hundreds of thousands of pro-life supporters. Abortion has been called the greatest abuse of human rights in our time by pro-life organizations. Current legislation allows a woman to terminate her pregnancy. 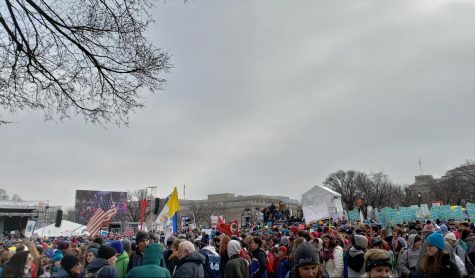 Thousands of people have taken a stand against abortion at the biggest pro-life event in the world: The March for Life. 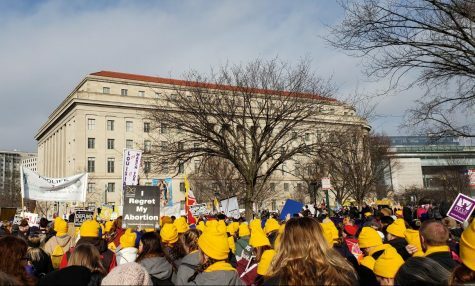 On Friday, Jan. 18, 2019, students, religious leaders, and adults alike gathered in Washington, D.C. to fight for the unborn. The first March for Life took place in 1974, one year after the momentous Roe v. Wade case was settled by the Supreme Court. The decision legalized abortion in all three trimesters of pregnancy, sparking both excitement and protest across the United States. 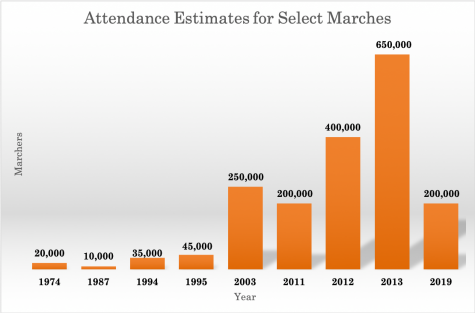 About 10,000 people attended the first march, and they vowed to continue this tradition until the decision was overturned. 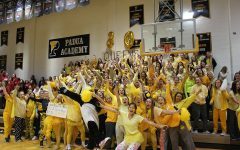 A group of seventeen students and three faculty from Padua attended the March for Life this year. As a continuous supporter of the march, Mrs. Alinda played a crucial role in organizing the entire day. 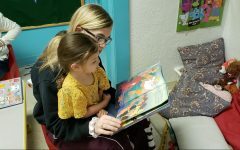 Although she did not attend, she cares deeply about all life issues, including abortion, euthanasia, and the treatment of people with disabilities. Seeing young students stand up for their beliefs in this way brought Alinda much joy. She was grateful for their eagerness and enthusiasm to participate in the event. Alinda hoped that this experience would inspire the students to continue fighting for life, especially when voting in the near future. Marchers prepare to begin their journey to Capitol Hill. Mud was an unavoidable obstacle in this process. Mrs. Kilmon attended the march with the students and had always been involved in the pro-life movement from a young age. She echoed the idea that all people should be respected, regardless of their stage in life. Kilmon and Alinda pointed out that the March for Life is not the only way to be a pro-life advocate. Respecting all life can be done through volunteering, prayer, and caring for others, and everyone can begin at a young age. 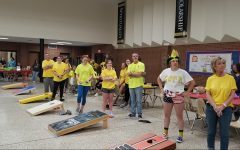 This year’s theme was “Unique from Day One: Pro-life is Pro-Science.” It stressed the fact that, according to biology and Christian beliefs, life begins at conception. Before the march began, a number of guest speakers were featured at the initial rally held on the muddy, snowy Mall. Mancini expressed her gratitude for the hundreds of thousands of marchers, many of them students. 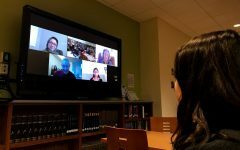 “It is important that our lawmakers hear from pro-life Americans, especially young people,” Mancini said. Together, the Congressmen and women from both political parties defied the common belief that banning abortion is stereotypically a conservative issue. Mancini reminded everyone that a person does not have to be religious or a Republican to be pro-life. Since the first March for Life, thousands of pro-life marchers have descended on Washington to protest abortion. All are maximum estimates provided by the official organization. Mancini was proud to present two of the highest-ranking pro-life advocates in attendance. Vice President Mike Pence and Second Lady Karen Pence made an unannounced appearance to show their support for the pro-life marchers. Pence ensured the attendees – and supporters numbering in the tens of millions – that they were not alone in fighting for the end of abortion. He and the Second Lady emphasized that they, along with the president, would continue to support the pro-life movement. “We will stand with you until that great day comes where we restore the sanctity of life to the center of American law,” Pence said. President Donald Trump spoke at the rally via satellite broadcast. He expressed his stance against abortion and his support for faith-based adoption services. “We know that every life has meaning and every life is worth protecting,” Trump said. Trump promised to strike down any bill that funded abortion with taxpayer dollars. No permanent steps have been taken to defund services in the U.S., but he suggested that change is near. Pro-life advocates march through the streets of Washington, D.C. while chanting and holding their signs high. 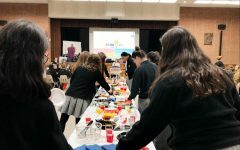 Numerous schools and dioceses were represented. Sophomore Diana Kenes felt awestruck after her first experience at the march. She figured it would be “fun” and had always been interested in the pro-life cause. Kenes described the entire day as “super crazy” and felt somewhat intimidated by the enormous crowds present. The powerful speeches from both Trump and Pence had a great impact on her. Kenes “definitely” wants to attend the march in the years to come and encourages others to do the same, even if they do not know the logistics of the event. 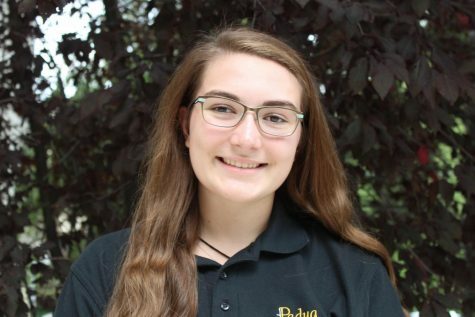 Lexie Weinkopff, a senior who had attended one march previously, is “very passionate” when it comes to abortion issues because of her years at Padua. Since joining the movement, she has participated in numerous pro-life events, but the March for Life was the most youth-oriented. Weinkopff likes getting involved in the realms of both religion and politics, and abortion is at the center of each. She felt very excited to be just a small component of such an enormous protest. 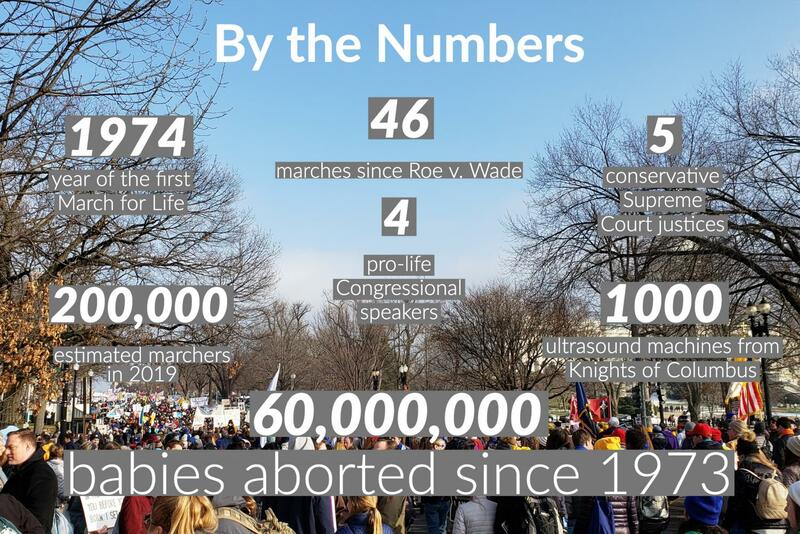 Here is a brief summary of the March for Life, by the numbers. What stood out to Weinkopff the most was the vast number of people present, gathered together as a unified force. She noticed the crowd size to be a major difference from the march in 2018. This experience made Campbell feel like others were listening to her. Marching for her beliefs gave her a voice and the chance to stand up for something about which she truly cared. Meet Emily. She is excited to make new friends and start a new chapter in her life as her freshman year at Padua Academy begins.